Antiques Roadshow experts say a Faberge ornament they recently valued could be one of the most significant finds in the show's history. Jewellery expert Geoffrey Munn valued the intricate Faberge object at about £1m, The Express and Star reports. The show was filmed at the Black Country Living Museum in Dudley, West Midlands, on Wednesday and will be aired later this year on BBC One. The Antiques Roadshow team is currently filming its 40th anniversary series. 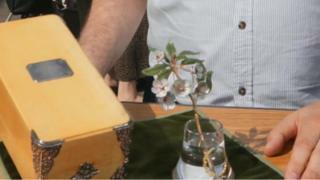 The show's executive producer Simon Shaw said the ornament, which is shaped like a stem of flowers, was likely to be one of the show's most expensive valuations. Builder Dan Bansal, 50, from Hagley, observed the valuation and told the Express & Star Mr Munn was stunned by the quality of the ornament. "The expert said it's probably the second time he's ever done that type of valuation," he said. "I think he was reluctant to say £1 million and nervous to say it was worth that much." Mr Shaw said: "We've had one of the most significant jewellery finds in 40 years of Antiques Roadshow history - but we don't want to spoil the surprise." The series will be aired in the autumn.